Winter in the Ravine, c. 1912, by Indiana painter Theodore Clement Steele (1847-1926). 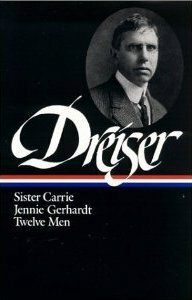 The indispensable Theodore Dreiser Encyclopedia tells us that in 1902 Dreiser began work on a story with the preliminary title of “A Samaritan of the Backwoods.” A friend of his wife had asked him to publish a profile of her father, who was a doctor, and Dreiser agreed. But, unable or unwilling to write about a man he didn’t know, he eventually shifted gears and wrote instead about Amos Wooley, the country doctor from his own teenage years in the mid-1880s, when Dreiser’s family lived in Warsaw, Indiana. The resulting profile of “Dr. Gridley,” then, is really a work of fiction: a composite panegyric that blends anecdotes from the lives of two rural doctors, both beloved for making home visits, practicing folk medicine, and dispensing soothing advice. He fussed with the story for the over fifteen years, and it was finally published as "The Country Doctor" in Harper’s Magazine in 1918—but only after Dreiser turned down the magazine’s first two offers ($275 and $300, according to his diaries, which don’t reveal the final sum paid to the author). The following year he included the story in his collection Twelve Men, which gathered two decades’ worth of sketches of people he had admired. How well I remember him—the tall, grave, slightly bent figure, the head like Plato's or that of Diogenes, the mild, kindly, brown-gray eyes peering, all too kindly, into the faces of dishonest men. . . . If you don't see the full story below, click here (PDF) or click here (Google Docs) to read it—free! What an ardent pen picture of a sensitive, caring and selfless doctor! Reminds me of Goldsmith's Village School Master. For this man doctoring was not a profession but a calling. Not in the least mercenary, he just believed that every one , great or small needed sympathy and this doctor gave it in good measure. How I wish we could have more such doctors. May their tribe increase! This story is a wonder to me. It skillfully spans the depth and understanding of human emotion at the more noble level. It provokes me and this is precisely what I expect artful storytelling is to do. It is beautifully presented by this "observer" with enlarging, anecdotal remarks by "knowledgeable others." In a word, and in my opinion, remarkable.